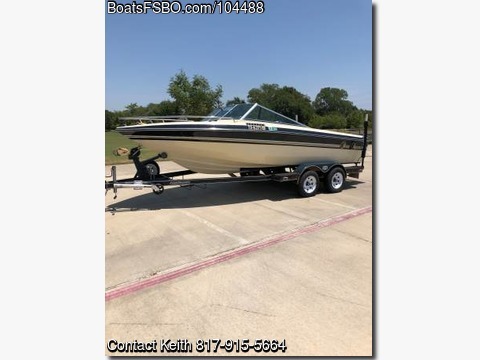 Please call owner Keith at 817-915-5664. LAKE READY NOW!! --Ski, Wakeboard, Surf, Kneeboard, Barefoot, Slalom, Tube and Extreme Tube behind This Boat. 1985 Sierra Supreme, by Ski Supreme. Ford V8 - 351cc Cleveland Engine (Indmar) 708 hours. Completely Refurbished to Like New Condition. Roadrunner Tandem Axle Trailer (5 new tires including spare). Boat and Trailer Registered until mid-2019. Both Titles in Hand. 21' with Step Through, Open Bow Concept. Custom Made Sunbrella Boat Cover. Fiberglass and Teak Swim Step. Barefoot Ski Boom by Barefoot International. All Upholstery is Brand New (as of this week)! Always Kept Indoors and Covered. New Bluetooth Sony Stereo and 4 New Speakers. Trailer has cosmetic rust but recently checked and all welds are solid. This is a beautiful boat with lots of power. We've pulled six people at the same time. It runs great, sounds great and looks great. It has the pedigree of a competition tournament boat but one of the first ones built for family fun. It's very spacious - most of the older competition boats do not even have room to step between the driver seat and the engine cover because they are touching each other. This boat has actual seats throughout instead of just cushions mounted to the floor. Ski storage located port and starboard, and built-in storage under every seat except the two captain's chairs. This boat has had only two owners and we both maintained the boat and engine well above the factory recommendations (he changed the oil every year). This one will go FAST!! Thanks, but I do not need help selling this boat.